Conventional Milling Machine Service And ScrapingCONVENTIONAL MILLING machine mechanical oriented services and electrical oriented services, Bed scraping also doing. 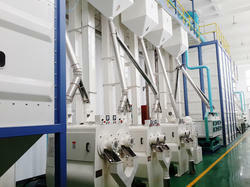 Our organization is rendering Flour Mill Repairing Services. This service is completed at low prices. This service is handled by professionals who have affluent industry practice and skill. Additionally, this service is widely admired in the market for their timely completion. We are one of the foremost firms of Milling Machine Repairing Service These services are enormously well-liked in the market for their nominal rates. Due to high demand, we render these services in diverse terms and forms. Besides, we render these services at nominal costs to our customers. Our company has achieved widespread recognition in providing Milling Machine Repairing Service. With vast industrial expertise and affluent knowledge of this arena, we are readily instrumental in providing world class Dal Mill Machine Repairing Service. As per the detailed desires of our clients, these presented services are broadly cherished. In addition to this, these could be altered as per the varying desires of our clients.